At Momosan, noodles are front and center. Whether indulging in a bowl of signature tonkotsu ramen, tokyo chicken ramen, tantan, or tsukemen, you’ll realize it is quality you can only find dining with an Iron Chef. For those craving more than just ramen, you too have come to the right place. Start off the meal with an exclusive appetizer, ranging from edamame and pork gyoza, to more playful dishes such as crispy mimiga (pig ear) and peking duck tacos. Momosan Waikiki is also excited to offer signature skewers salt or soy marinated and grilled over white charcoal. Or Yakimono, choice of tender beef tongue, Japanese mackeral or oysters grilled over white charcoal offers endless flavors. Pair your appetizers and noodles with one of 20 sake options, eight of which are Morimoto signature sake, served by the glass, carafe, and bottle. Choose between 6 draft and 4 bottled beers, including a classic Japanese style lager, three Morimoto signature beers in collaboration with Rogue Ales, two local brews or Kirin Frozen too keep you chilled in paradise. Wine more your style? Momosan also offers 2 white and 2 red wines, both by the glass and by the bottle as well as a beautiful rosé. Stop by alone and grab a seat at the bar, or with a group and relax at one of the communal tables. Drop in for a lunch set, or feast on appetizers and noodles for dinner. 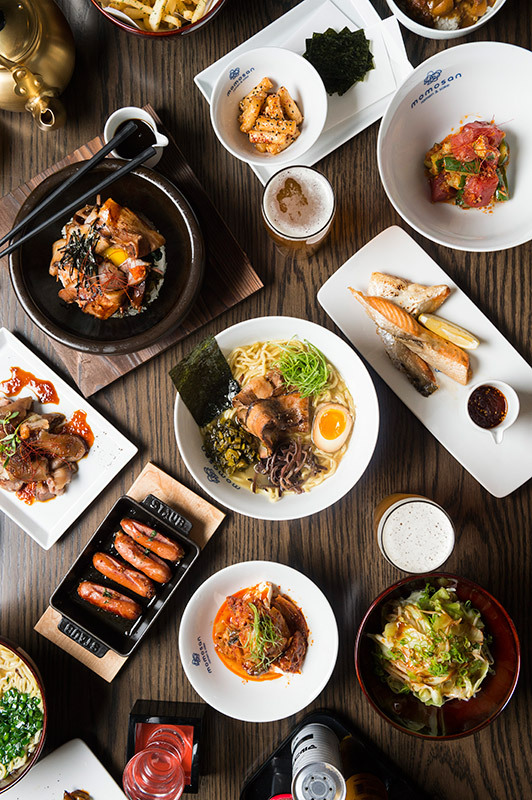 Wash it all down with a Morimoto signature sake, beer, or wine. No matter which path you choose, with your meal in the hands of Momosan, it’s bound to be unforgettable. Chef Morimoto. 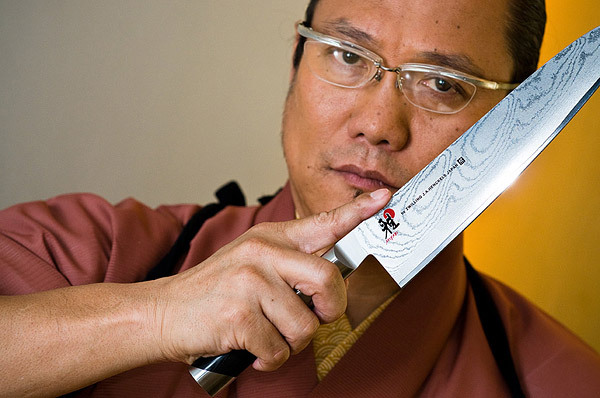 Iron chef Masaharu Morimoto. Morimoto san. Momo san. 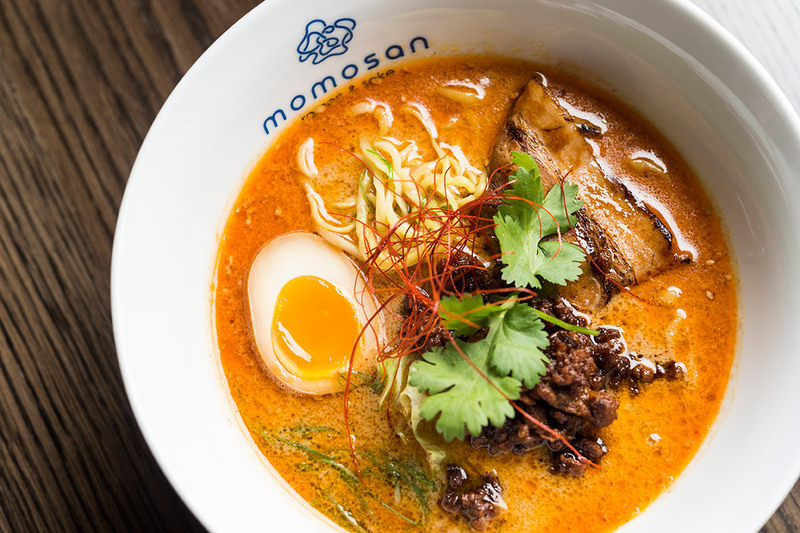 Momo san, a moniker for Chef Morimoto (Morimoto san shortened to Momo san) is not only a new concept, but also signifies the formal and formidable second entrance of Morimoto into the world of ramen. While Momosan Ramen Waikiki is his second ramen shop, Momo san himself is no stranger to the cuisine. 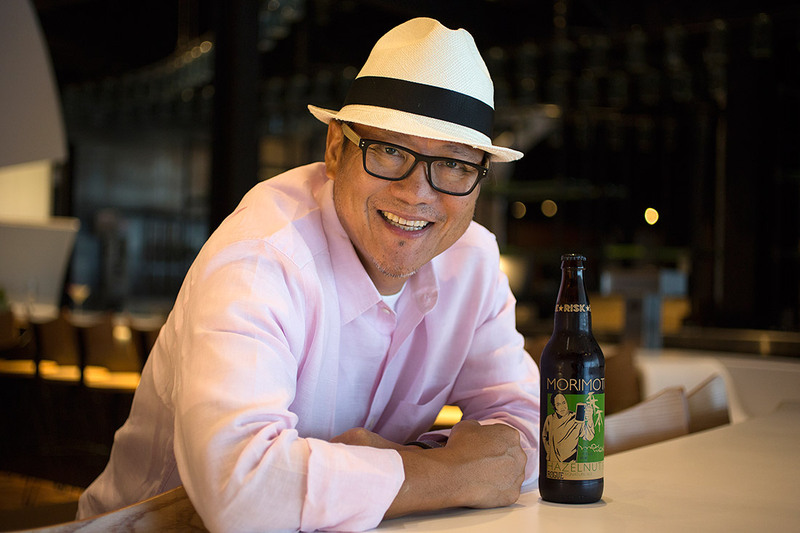 Having grown up and honed his skills in Japan, where ramen is a staple dish, Morimoto developed an early love for noodles. 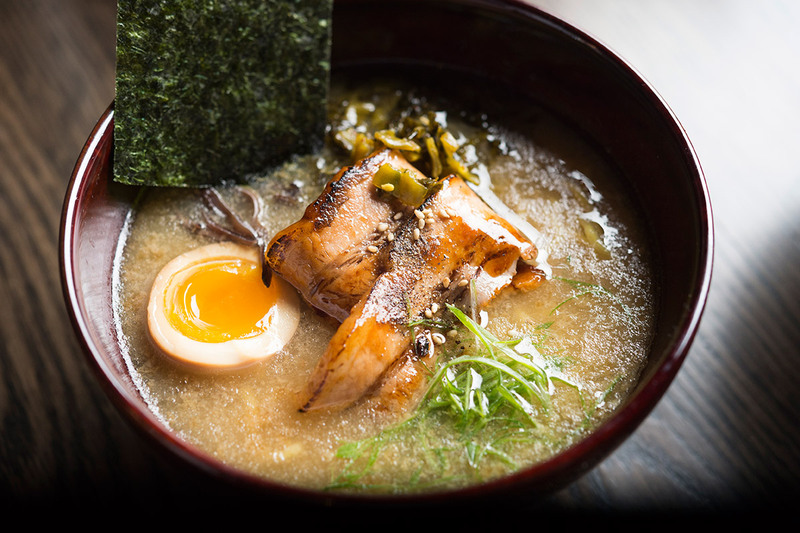 Bowls of ramen have been on Morimoto’s menus across the country since 2001, well before the so-called ramen began in New York City. At Momosan, Chef Morimoto brings his favorite food and drink from his home in Hiroshima, Japan to his adopted second home in Waikiki. 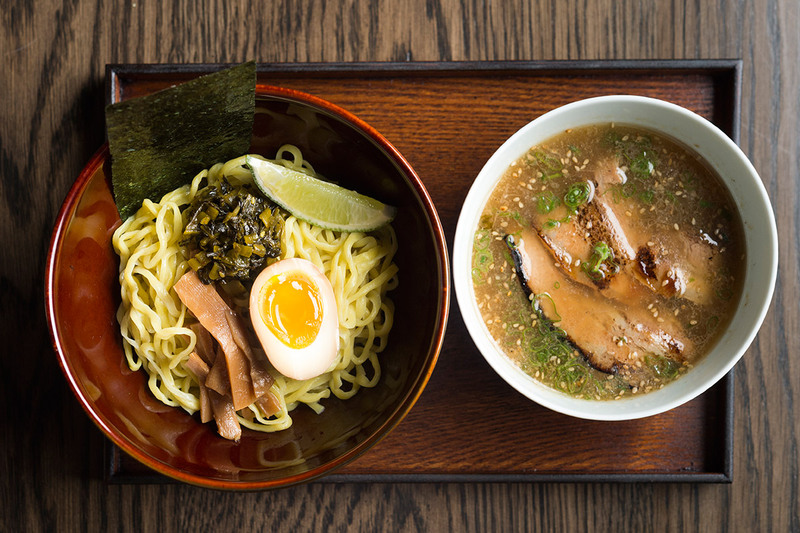 Noodles are front and center on the ramen focused menu, and are paired with playful takes on authentic Japanese comfort food and delicious sake. 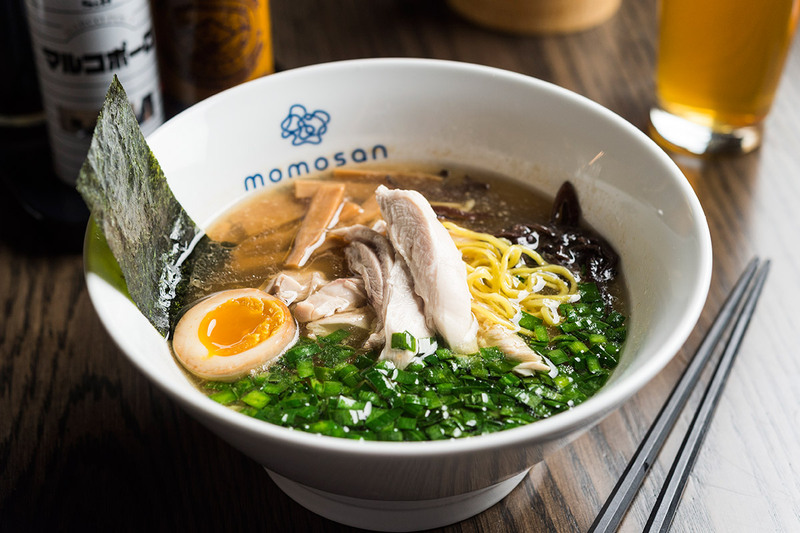 Momosan Ramen & Sake offers the chance at a casual, slurp-filled Morimoto experience, without losing the Iron Chef quality guests all over the globe have come to expect. Tonkotsu, a ramen broth, which originated in the Kyushu region of Japan, is traditionally made up of nearly 100% pork bones that are boiled for twenty plus hours. Kyushu style tonkotsu is extremely pungent, with a thick consistency, and typically white in color. Thin, round noodles are used, so that the noodles are able to fully absorb the flavor of the strong soup. Momosan tonkotsu steers away from the traditional Kyushu style, offering a soup that is more approachable, but still delivers on richness, strength and flavor. A combination of 70% pork bones and 30% chicken bones are boiled for twelve to fourteen hours, resulting in tonkotsu that is darker in color, with less pungency, and a smoother consistency. Momosan noodles are classified as temomi noodles (translating literally to hand massage), which have both thinner and thicker segments to help grab onto the soup while slurped. The noodles are slightly thicker than classic tonkotsu style, allowing them to float at the top, rather than sink to the bottom. Additionally, the noodles are aged, adding an extra layer of deep flavor and umami. Toppings include braised pork belly chashu, aji-tama (overnight soy marinated egg), takana (spicy mustard leaf), kikurage (wood ear mushrooms), toasted nori, and homemade garlic oil. In the U.S., tonkotsu has become incredibly popular, appearing on the menus at ramen shops across the country. In Tokyo however, when locals think of ramen, they crave a lighter, soy based chicken ramen. Momosan Tokyo chicken ramen, an ode to Tokyo style ramen noodles, combines flavorful chicken soup with a soy(ta-re), or seasoning. The soup, made up of 100% chicken bones which are simmered for 12 hours, is simple, yet deep in pure chicken flavor. When compared to tonkotsu, chicken ramen is on the lighter side, with a smooth, easy to drink consistency and less lingering fattiness on the palate. Toppings include steamed chicken, aji-tama (overnight soy marinated egg), menma (soy braised bamboo shoots), seared garlic chive, kikurage (wood ear mushroom), and toasted nori. Momosan tantan ramen combines Japanese and Malaysian flavors into a unique dish packed with bold flavors. Tantan, which originated in China, shows its roots through the use of chili flakes and red miso ground pork. Coconut milk, chili paste and red curry paste add Malaysian elements to the dish, while Momosan tonkotsu soup and sesame paste give the dish a strong Japanese backbone. The combination of these diverse ingredients create a bright orange spicy coconut curry, with pleasant creaminess and rich pork flavor. Toppings include pork chashu, red miso ground pork, aji-tama (overnight soy marinated egg), cilantro, scallion and chili thread. Tsukemen, or dipping ramen, is a completely distinct ramen experience. Unlike a typical bowl of ramen, Tsukemen is served in two bowls, separating the extremely hot soup from its chilled noodles and toppings. The cold toppings are meant to be dipped into the concentrated bowl of Tonkotsu and chashu, and slurped. While it may be tempting to pour the tonkotsu over the toppings and drink, combining the two bowls into one, the resulting mixture would be over seasoned. When dipped, the thick noodles grab onto the soup, achieving the desired combination of flavor and seasoning. At Momosan, Tsukemen is served with a lime, to be squeezed over the toppings after enjoying half of the noodles. The acidity from the lime adds a new flavor profile, essentially creating an entirely new dish. Toppings include pork chashu, menma (soy braised bamboo shoots), aji-tama (overnight soy marinated egg), takana (spicy mustard leaf), garlic oil, toasted nori, and lime.